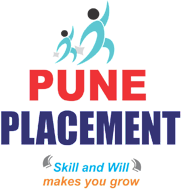 Pune Placement is a Pune (Maharashtra, India) based company, which is engaged in offering the best-in-class placement consultant services. With our services, we are helping the candidates & fresher in getting placed in one of the best companies and make a good future. Helping the clients through different phases of various walk-ins, placement drives, etc., and assisting them in how to crack those interviews and placement drives is our expertise. Clients can connect with us any time to avail the benefits of our services at market-leading charges.